This past month things have been quiet here at This Odd House while I’ve been readjusting to the teaching life after a luxurious sabbatical year. It didn’t necessarily feel luxurious at the time. But now that I am back in the thick of academic life, I have an even greater appreciation for that gift of space. For that extra room to write. This past month I’ve also been trying to figure out a new and sustainable way to blog. A way that makes sense in my real-world, non-sabbatical life. It’s a challenge, for sure. As many of you well know. To maintain some measure of health—body, mind, and soul. To give yourself fully at home and at work. And also to write. Moving forward I want to offer several posts around a theme. Some from me. Some from others. Some from you. Waiting has been a theme in my life. And I know I’m not alone. It’s the subject of the chapter I’m currently writing for the This Odd House manuscript. It’s something God has asked (forced?) me to do—time and time again. It’s something I’ve resisted, resented, and come to appreciate. It’s also something that Scripture addresses repeatedly. So there’s plenty to talk about. So…maybe you find yourself in some sort of waiting room right now. Or maybe you’ve spent your fair share of time there. 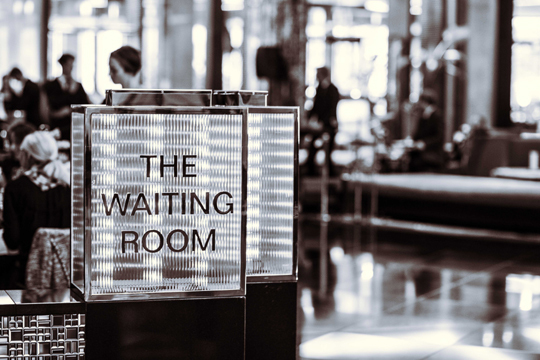 Maybe you have a story about waiting, some reflections on that waiting place, some lessons learned, or a Bible passage that has spoken to you in the midst of a wait. If so, please get in touch. Comment. E-mail. Send me a potential guest post. Let’s learn what we can about the waiting room. Let’s encourage those who might feel stuck there right now. Let’s talk. To get us started, here’s just a little story about an otherwise-frustrating day when my 3-year-old, Miss Personality-Plus, showed me what it might look like when we wait well. Back in June I had a stubborn infection in my right eye. After trying for too long to take care of it with Visine, I finally made an appointment with our GP. Peter and Daryl were at camp that week. So poor, nap-less Amelia had to come with me. We arrived right on time that afternoon, checked in at the desk, then settled in—side-by-side on a sofa—to wait. We flipped through magazines. Scrolled through pictures on my phone. Sang nursery rhymes as silently as we could. By the time the nurse called my name, Amelia had finished with the sitting and the sympathizing. And she was running around the waiting room. Giggling and screeching. I knew she was overly tired. And that any attempt to contain her would certainly elicit a violent protest. The waiting room was nearly empty. And I was already fighting a headache. So I chose to let her run. In the examination room, the nurse took my vitals while Amelia—true to form—explored every inch of the space. I kept one eye on her and one on the nurse as I explained my symptoms and she typed them up. Then the nurse rose and informed us that, unfortunately, the doctor was running behind that day. He would be with us as soon as he could. But we would have to wait. She closed the door behind her. And I turned to see Amelia’s feet sticking out of a bottom cupboard. She was looking for picture books. Like her pediatrician has. But this cupboard contained only medical supplies. And we were going to have to improvise. I pulled a half-eaten box of raisins from my purse and doled them out, one at a time, while we entertained ourselves with a cholesterol brochure, hunting for letters and making up stories about the people in the pictures. Then—finally—the GP breezed through the door. I raced across town. But by the time I pulled into the eye doctor’s parking lot, Amelia was sound asleep. As I unbuckled her and pulled her from her seat, I braced myself for a blood-curdling scream. Thankfully, none came. She was too tired to care. In the waiting room, she sat next to me in a stupor while I filled out several forms. By the time the technician called us in, though, she was coming to. And while he examined my eyes, Amelia again examined the entire room. Opened cupboard doors. Climbed on chairs. Pulled tissues out of the box. Tried to turn the water on. While my eyes were otherwise occupied, she took full advantage. When the exam was finished, we tidied up her tissue mess. Then the technician invited us to follow him down the hall. To yet another waiting room. I wanted to protest. “My child hasn’t had a nap.” But really, I was the crabby one. We tucked ourselves into a couple of corner chairs. Amelia and me. And I glanced around the room. This waiting room was full. People of all ages lined the walls. Mostly looking miserable. With their sore and bandaged eyes and their interminably long waits. But Amelia must have seen something else. Within moments she was on her feet. She introduced herself to the grandparents on our left. “I’m Mia,” she said. “What’s your name?” And when the grandmother said her name was Dory, Amelia looked back at me with wide-eyed wonder and exclaimed, “She knows Nemo!” And several people in that little waiting room couldn’t help but smile. Then Amelia told Dory about Goo Goo Gaga, her imaginary friend. About how he really needed a nap today. But he couldn’t get home. 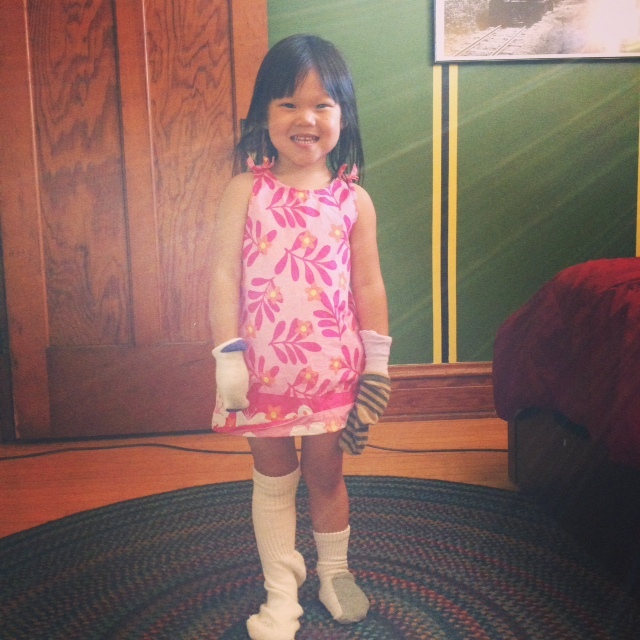 “Poor Goo Goo Gaga,” Amelia said. And Dory agreed. I’ve spent a fair amount of time in the waiting room of life. Waiting for the next event. Waiting for an end to a particular pain. Waiting for clarity. For answers to prayer. In fact, I suppose I’m waiting again right now. I’ll be the first to admit that I haven’t always waited well. I’ve sat, grumpy, against the wall. With sore and blinded eyes. I’ve been angry at times. Impatient. Sad. Scared. I’ve let the wait consume me. I’ve tried frantically to hurry the outcome. And in certain moments I’ve even felt hope slip away. And I’ve learned that I want to wait more like Amelia did. I want to see and seize the opportunities that only the waiting room holds. While I wait, I want to sing and to sympathize. To run and to giggle and to explore every inch of the place. I want to reach out and connect with people. Others who are waiting perhaps. And I want to make them smile. I want to share our stories. And our concerns. And, of course—as awkward as I might be—I still want to try to dance. Yes, waiting can be so hard, especially in a busy world. I had the best conversation with an older couple while waiting, impatiently at first, and felt so blessed all day after talking to them. I’ve waited for pain to subside, job offers to come our way, what state the army will send us next, waiting for a child to wake up from surgery. And have hated and rejoiced during these waits, but always grateful for God’s hand holding us up through it all. Thank you for reminding me of all my waiting periods and how I’ve grown to depend on Him through it all. My lovely friend has written something I’d love to share. Maybe you can relate to waiting (in the best and worst of times). How do you wait? Are you “good at it”?